Sustainable Development Goals (SDGs) are common goals for the global community to achieve. Seventeen SDGs have been determined in General Assembly of the United Nations in 2015. These goals are composed of three main topics: social issues, economic issues, and environmental issues. Climate is one of the most important factors that affect many issues across the main topics of the SDGs. As local climate information are indispensable for the assessment of local climate or environment, downscaling has been, for more than 25 years, believed to be a good technique to produce such local climate data. On the other hand, some researchers still suggest that downscaling is only a transient research field, which would disappear if the resolution of global models (GCM) becomes high enough. There are also more optimistic suggestions that downscaling research field continues as it responds to the diverse and specific demands of impact study researchers and end-users. In this workshop, we would like to discuss two main issues. To guarantee the robustness of the results of downscaling, it is very important to explain the climatological and meteorological mechanism of local climate change. By using downscaling results, we have two kinds of advantages compared to AO-GCMs results. (1) High resolution response to orography, land-use or SST. 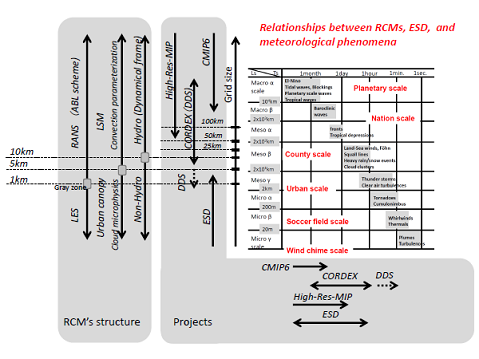 (2) The effects of synoptic- to meso-scale phenomena. Here, we hope to discuss on the mechanisms of local climate change, by using downscaling methods. (1) Expanding the scope of application of dynamical and statistical downscaling to other sectors and research fields. (2) Progress of interdisciplinary research using downscaling. (3) Applications of dynamical and statistical downscaling in Asian countries. In the workshop, we expect to have a free discussion on the potential of downscaling research. Dynamical Downscaling: Is it Worth it? The deadline of registration is 4 September 2017. Please apply by clicking the button below. When we receive your entry, we will confirm it by E-mailing you. Fields indicated with an asterisk(*) are required. Your personal information provided here will be managed by the Secretariat of the Symposium, Prime International Co., Ltd., and your data will be used only for the purpose of this Symposium. Your personal information will be disclosed to other agencies who are involved in organizing this Symposium. Unless otherwise agreed by you or requested by law, your personal information will not be disclosed to the third parties except to those who are engaged in this Symposium. If you have any questions or comments on personal information, please contact the Symposium Secretariat. For any queries regarding registration, please contact the Secretariat. The deadline of abstract submission for oral presentation has been postponed, 4 September 2017. A one page abstract (A4 size, 210 x 297 mm) is required for each presentation. It should contain the title of paper, author(s), affiliation(s), postal address, main text (including all figures, tables and references) and e-mail address of the main author. Detailed instructions are available in sample_abstract. The abstract should be in pdf format or word file. You can submit your abstract through abstract submission on the website of "International WS on DS 2017 at Tsukuba." Your registration number will be required for your on-line abstract submission. Please complete your on-line registration before abstract submission. If you are unable to upload your abstract using this form, please send your abstract (in a PDF file) as an e-mail attachment to dsws2017@pco-prime.com. 10 min. walk from bus station. Tsukuba station is a train station of Tsukuba Express line (TX) located in the basement. Go up the escalator at Exit A3, and you will come to Tsukuba Center bus terminal, where major airport and local buses depart/arrive. Travel arrangement should be made individually. Using a bus is the easiest way to get to Tsukuba from Narita Airport. *Bus ticket cannot be reserved from Narita / Haneda airport to Tsukuba center . *From Tsukuba center to the airport, bus ticket should be reserved in advance. Haneda Airport International Terminal station to Shinagawa by Keikyu line, Shinagawa to Akihabara by JR Yamanote or Keihintohoku line, and Akihabara to Tsukuba by Tsukuba Express line (TX). Haneda Airport International Terminal station to Hamamatsucho by Tokyo Monorail, Hamamatsucho to Akihabara by JR Yamanote or Keihintohoku lines, and Akihabara to Tsukuba by Tsukuba Express line (TX). For details, please see Haneda airport’s access infomation by rails and monorails and TX info. below. Approx.45-52min., 1,190 yen. About 4 services every hour. 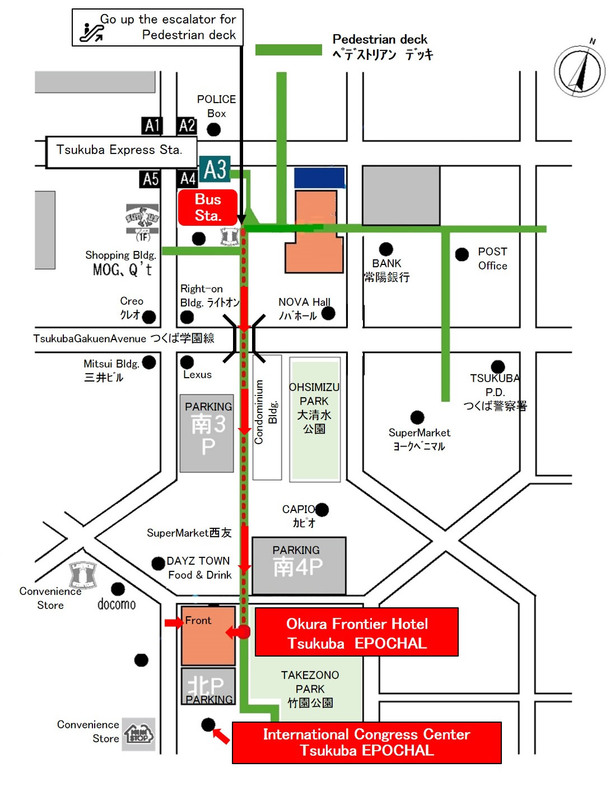 The closest and most convenient hotel is Okura Frontier Hotel Tsukuba – Epochal. The organizer blocked some rooms at Okura Frontier Hotel Tsukuba EPOCHAL and also at the main building from October 1st for 4 nights for special conference rate. More details will be announced in the registration confirmation e-mail. * Please be noted that the first come, first served. Reservation will be closed on September 18th. Participants are recommended to purchase appropriate travel insurance before coming to Tsukuba, Japan. Secretariat is not responsible for any kind of personal acccidents, sickness, theft, or property damage encountered by conferees during theirstay in Tsukuba. Copyright © 2017 International Workshop on Climate Downscaling Studies. All rights reserved.